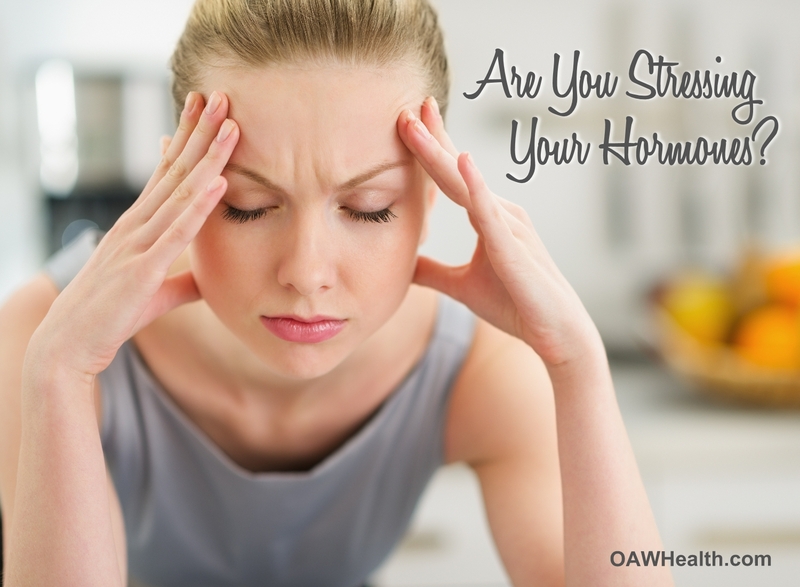 OAWHealth · Articles · Progesterone (Natural) · Are You Stressing Your Hormones? Creating health during menopause is every woman’s goal. We are led to believe estrogen—or lack of it—is the cause of menopause symptoms. In this article, I want to clarify that this is not the primary hormone produced by the ovaries. Ovaries also produce androgens, such as DHEA and testosterone, as well as progesterone. Total well being depends on adequate levels of these hormones. Organs and body sites other than just ovaries, produce androgenic hormones. These include adrenal glands, the skin, muscles, brain, pineal gland, hair follicles, and body fat. As the hormone production decreases in the ovaries, the production of androgenic hormones increases from these other sources. It’s clear, healthy women are well equipped to handle hormone changes, not requiring hormone replacement. Approximately 15% of women are symptom free. If you approach menopause in a state of emotional and nutritional depletion that has affected optional adrenal function, you will need hormonal, nutritional, emotional, and other support during the menopause transition until your endocrine balance is restored. When your body is stressed at sustained high levels, the over production of the hormone cortisol, produced by the adrenals, gradually tears your body down. It destroys healthy muscle and bone; slows down healing and normal cell replacement; co-opts biochemicals needed to make other vital hormones; impairs digestion, metabolism and mental function; interferes with healthy endocrine function; and weakens your immune system. It's important to emphasize the role of emotional factors. Guilt, pain from past hurts, self-destructive habits, unresolved relationship problems—your past and present emotional experience may serve as an ever-present stressor. Dealing with these problems directly is much more beneficial than trying to compensate for the stress they create. Conventional medicine’s focus on drugs tends to suppress early-stage symptoms rather than treat their underlying causes. This can have the effect of delaying treatment until a disease state has developed. Think positive thoughts. If a problem starts to tug at your thoughts or emotions, look on the bright side. See everything as a learning experience not a message that you have messed up or are defective in any way. Learn to not take on other people’s problems. Find a favorite affirmation book or calendar to remind you each day of something positive. Making dietary changes to enrich your nutrition and reduce carbohydrates and stimulants. We recommend the addition of high-quality nutritional supplements, including essential fatty acids from fish oil, organic & unrefined coconut oil or organic, unrefined hemp oil. Reducing stress includes meditation, moderate exercise, and taking more time for you. It's helpful to make a list of your stressors, especially those that are constant. If needed, make lifestyle and/or friendship changes to get out of the stress track. Getting more rest. Your body needs time to heal. The body does the most healing between the hours of 10:00 p.m. and 2:00 a.m. If you are up during these times you are robbing your body of the natural healing process. Accepting nurturing and positive feedback from those around you. Getting a pet can do wonders in this area. Making a list of priorities and let the rest go. Don’t try to be Wonder Woman. Using herbs, aromatherapy, acupuncture, and massage is helpful. Loretta Lanphier, NP, CN, HHP, CH is a Naturopath Practitioner, Clinical Nutritionist, Holistic Health Practitioner and Clinical Herbalist in The Woodlands, TX area and CEO/President of Oasis Advanced Wellness. A teacher, educator and author, she counsels Oasis Advanced Wellness clients on the aspects of getting the body healthy and keeping the body healthy. As a cancer survivor, she is able to relate extensively, both as a patient and a practitioner. She has been privileged to share her cancer survival story with hundreds of people during seminars and lectures. Her passionate style of truth and straight-forwardnessin an easy-to-understand format is very refreshing to even the most discerning of audiences. Lanphier is dedicated to helping people create lasting changes in their health and enhancing well-being through whole body nutritional balancing including physician strength supplementation. She is also Editor and contributor to the worldwide monthly newsletter Advanced Health & Wellness.